Central Africa was poorly defined as a region until the creation of the colonial-era territories. The sultans ruled large conquered populations in the north and east of present day Central African Republic (CAR). The title of sultan was given by the Congo Free State agents to local rulers in Bangassou, Zémio and Rafaï in the early 1890s. They included the famous slave-trader al-Sanusi, (of Dar al-Kuti), and the sultans Labasso (of Bangassou), Zémio, and Hetman (of Rafaï), the heads of conquering dynasties. The conquered populations of mostly Adamawa-Ubangi-speaking peoples such as the Banda and the Zande-Nzakara in eastern CAR had previously lived in stateless societies without hereditary or paramount chiefs. The Gbaya (including the Mandjia) in the centre and west and the riverine peoples along the Oubangui and Mbomou in the south had no hereditary chiefs either. They had leaders of different kinds, such as clan leaders, hamlet headmen, and temporary war chiefs to lead warriors in battle, but no titled rulers with hereditary authority. The sultanates were therefore the first states to be established among the Adamawa-Ubangi-speaking peoples of central Africa. A short-lived Islamic kingdom in the Central African Republic, in the early 1800s Dar al-Kuti was the name given to a stretch of the Islamic frontier south-west of Wadai which faced a perilous and unsettled existence until it accepted a French protectorate in 1897. Brother of Abd el-Kader, Sultan of Banguirmi. Governor of Dar al-Kuti. Former faqij trader. Died 1892. Nephew. Died in battle against the French on 12 Jan. The sultanate accepts the creation of a French Protectorate while maintaining direct rule. Sister. b c.1873. m Fadl el-Allah, eldest son of Rabih, c.1890. Kangaya, along with sixty loyalists, two hundred bazinguer warriors, and chiefs; Bakoungia, Dembao, Paoura, Asraga, Iatogo, and Bara, attack the Paoura factory on 27 December. Two agents of the Compagnie des Sultanats of Upper Oubangui, Bellard and Mallac, are murdered and the factory is damaged. The sultanate comes under direct French administration as part of their Protectorate. The Circonscription de Dar el-Kouti is created. Grandson of al-Sanusi. Sultan-mayor and head of the royal family. Born on 25 November 1926 in N'Délé, es-Senoussi is a member of the Territorial Assembly, which becomes first the Legislative and then the National Assembly, from 1957 to 1966. He dies in 1974. Ibrahim returns to the capital, N'Délé, after the death of his cousin, Mohamed. He assumes the traditional office of sultan in August 1974. However, the CAR Government choose this occasion to reassert its direct authority in the N'Délé Subprefecture by declaring the office of mayor of N'Délé to be a civil post, as it had been during the colonial period. Despite discontent, the Government appoints a functionary to the position. In this manner the sultan is stripped of most legal and administrative powers. Rafai was a Bandia-Zande kingdom located in present day Central African Republic. Kassanga (perhaps a warlord or an exile with a following) conquered the east of Zandé Country, around the Chinko river basin, and by circa 1800 he was the ruler of the Chinko river valley and founder of the later Rafai kingdom. Founder of the Bandia Kingdom of the Chinko. Rafai leaves his domains between the Chinko and the Moï rivers because of the Mahdist advance and makes his way south. He conquers most of the Djabir kingdom, establishing his court not far from that of the former Djabir rulers. War flares up between Rafai and the Djabir kingdoms, causing Rafai to move by the autumn of 1889 from south of the River Mbomou to the north bank of the river, establishing his court in what would later be known as Rafai city. On 31 March, Governor Merwart signs a new French protectorate treaty with Sultan Hetman. Upon the death of the last sultan, the sultanate is suppressed by the French. Mayor of Rafaï. b c.1907 in Rafaï. Natl Assembly member 1964-66. Bangassou was a Bandia-Nzakara kingdom in the Central African Republic. It was founded by Ndounga at the beginning of the nineteenth century, when he created the kingdom of Nzakara after the defeat of the Voukpata, the clan which ruled over the Nzakara people. Founder of the Bandia Kingdom of Nzakara. Died in a war against the Bougbou. Son and heir. Died 1904. On 14 June, Sultan Bangassou appears at Yakoma, a post belonging to Belgian king Leopold II's empire, and signs a treaty with Captain Alphonse Vangèle which places his kingdom under the protection of the Congo Free State. Bangassou facilitates the expansion of Leopold's empire and delivers enormous quantities of ivory to his company agents. He is therefore able to acquire 1500 guns and reinforce his army. After 1894 Bangassou becomes subject to French control. With the arrival of concessionary societies in 1900, Bangassou rapidly loses power. Injured during an elephant hunt, he passes away in the presence of the French Captain Jules Jacquier, the real ruler of the region. With his designated heir, Mbali, already dead, the Council of “Chiefs” designate Labasso, a half-blind leper, as Bangassou's successor. Upon the death of its last ruler, the sultanate is suppressed by the French. The title is still claimed by the royal family and it retains a very limited, informal degree of authority. Jailed and deposed by the French. Elected sultan in a restoration project which was abandoned. Chevalier de la Légion d'honneur. Territorial Councillor 1952-1957. The various sections of the Central African Republic fall under the control of a military ruler. This was a Voungara-Zande kingdom in the Central African Republic. It was founded by Nounga, a member of a Zande clan belonging to the Angoura branch of the Anounga. His domains stretched north (into the modern Mbomou Prefecture), and south of the River Mbomou (in the modern Congo Democratic Republic. Nounga was a Zande member of the Voungara clan. Originally the Royal Court was established on the north bank of the Mbomou. On 11 December 1894 Zemio and the Congo Independent State's resident to Zemio's Court signed a 'contract' stating that Zemio was to move his court to the south bank of the Mbomou (Article 6) and that Zemio was to give up to his rights to the territories on the north bank of the Mbomou (Article 1). Died 1858. Had 51 children. Son. Died on 12 October. Zemio agrees to move his royal court to the south bank of the Mbomou on 11 December. On 12 April 1909, Governor Merwart signs a new protectorate treaty with Sultan Zemio. In December of the same year Zemio realises that his rule south of the Mbomou is in fact no rule, due to Congo Free State rule in the region. Zemio moves to the north bank of the Mbomou, which was formerly the northern part of his domain, but which is now under French control. He establishes his court in what is now the city of Zemio. The sultanate is suppressed by the French. The Central African empire was founded by Jean Bedel Bokassa (1921-1996) who had the Central African Republic declared an empire. He was himself proclaimed Emperor Bokassa I by an Extraordinary Congress of the only political party, MESAN, in Bangui on 4 December 1976. About a year later, on 4 December 1977, he crowned himself emperor and his favourite wife, Catherine (born 1949), empress. On that same date he had his young son, Jean Bedel Bokassa (born 1973), appointed as crown prince and heir. Thanks to French military intervention the Central African empire fell. Bokassa was ousted and the Central African Republic restored on 20 September 1979. The French form a federation of colonial possessions in central Africa which comprises Gabon (previously occupied by several Bantu groups), Middle Congo (now the Republic of the Congo), and Chad, although the latter is not organised as a separate entity until 1920. Also added are Oubangui-Chari (or Ubangi-Shari), Dar al-Kuti, and the sultanate of Rafaï (all now the Central African Republic). The federation is dissolved as the republics become autonomous, with full independence being achieved in 1960. Jean Bedel Bokassa is the military ruler of the Central African Republic. In 1972 he declares himself president for life. In 1976 he proclaims himself emperor, with tacit French approval. 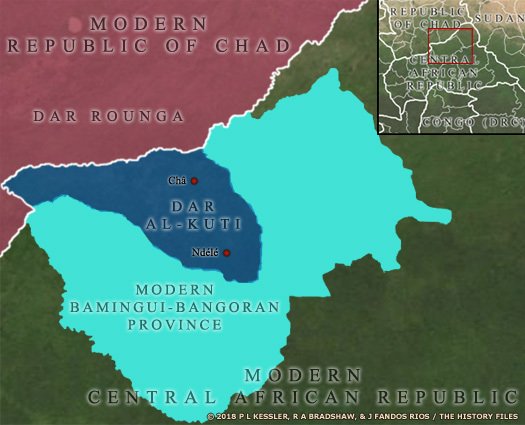 The CAR Government chooses to reassert its direct authority in the N'Délé Subprefecture in Dar al-Kuti by declaring the office of mayor to be a civil post, as it had been during the colonial period. Crowned emperor on 4 Dec 1977. Bokassa is born on 22 February 1921 in Bobangui (now within CAR), Middle-Congo. He dies on 3 November 1996 in Bangui. Heir from 4 Dec 1977. Born on 2 November 1973 in Bangui. French military intervention causes the empire to fall. Bokassa is ousted and the Central African Republic is restored on 20 September. Bokassa flees to the Ivory Coast where he remains for four years before being granted asylum by France due to his previous service in the French armed forces. Since late in 2013 neighbouring Chad begins to play host to tens of thousands of refugees who flee the fighting in the Central African Republic.